On Sunday I had a visit from a group of journalists from South Korea. They are in Tasmania covering a story on the forests. After meeting up with Bob Brown in the morning, they came out to The Observer Tree. Braving the 60 meter height, they came up the tree to talk to me about why I am here and about this forest. This is such a great opportunity to spread the message about these forests across the world. Hopefully they will take this story back to South Korea and many more people can find out about what I am doing. And for the last few days I have been having a great time with my sister. This is her first chance to visit me in the Observer Tree and it has been so great to see her again after all this time. She has been up in the tree since Sunday. Although we talk on the phone often, it is of course never the same as getting to spend time together. Having her in the tree has been so uplifting, as we have had many good laughs together and a lot of catching up to do. As you can imagine, time away from my family is one of the challenges of life in the tree sit. So it is so special to be able to have this visit from my sister, Rhiannon. When we were kids our Dad built us a tree house in the backyard. We spent many hours playing there together and climbing in all the other trees around the house too. Who would have know that all these years later we’d be laughing again in another tree house. This time about 58 meters higher than our childhood version! From the very first day I came up this tree Rhiannon has been backing me one hundred percent and giving me her support. As all of her friends would know, she talks about what I’m doing, spreads the word around where ever she can and inspires others to get active and involved in finding out about the forest campaign. It has meant so much to me to have her support and it is so great that she is finally able to come up here and see the Observer Tree for herself. I’m sure it has been an adventure for her, and a story she will be telling for a long time. Tomorrow she will be going back down to the ground and back home. I’m already feeling sad about her leaving and being alone again. But I will try not to let myself get sad yet, so that I can enjoy our last night together and have fun while it lasts! “This is one of the most outrageous things I’ve ever done! Personally it’s been an incredible experience for me. And I’ve faced some of my fears coming up here. I can’t believe it is so high and you, Miranda, are so brave! But it doesn’t take long to feel like home, because you’re here. It’s actually a surprise how little I feel frightened up here. There is s sense of security up here, with the tree supporting us and of course I’m really impressed by the professionalism and was put at ease straight away by the level of expertise and skill from Miranda and the ground crew when it comes to climbing and rigging. It’s actually inspired me to want to learn to climb trees. And maybe one day when the forest is protected, Miranda and I could go climbing some where just for fun. 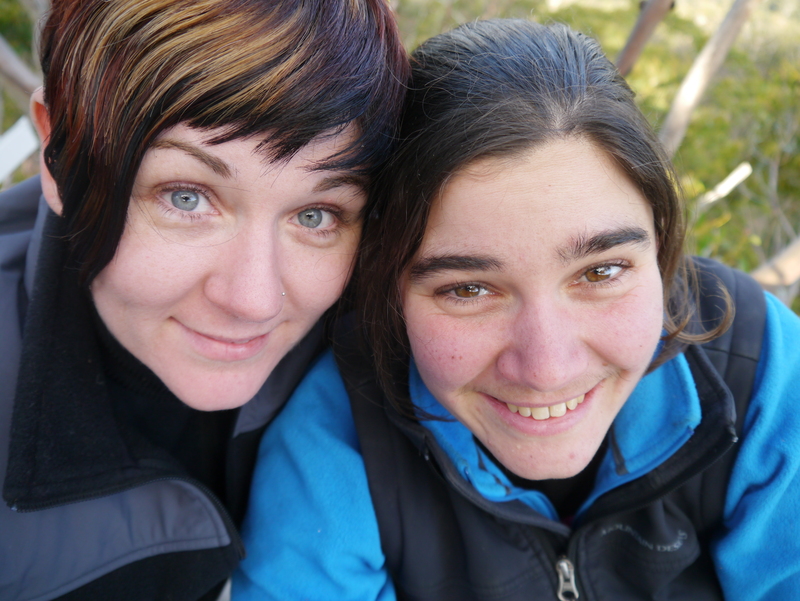 I really belive in what Miranda is doing and that is also important for people to stay engaged by reading the blog, connecting online with Miranda and following what is happening to the forests of Tasmania. I think it’s hard to comprehend, when you’re going about your daily life, the sacrifices that people like Miranda are making everyday in order to create positive change in the world. This has really opened my eyes to what activists do and the amount of dedication and committment that people give out of love for these forests. I guess it has also made me realise that everyone can make a difference. Not just people who are considered “activists” but all of us. We can all really do something by going out and talking to people and spreading the word about the issues that are important to us. I have been following Miranda’s blog and videos from the beginning of Observer Tree, so I had an idea about what it would be like. But when you get up here in real life, it is so incredible. It’s such a special place. Posted on September 18, 2012, in Daily Blog, Photos. Bookmark the permalink. 8 Comments. This is an immensely strong ancient bond, with which you send a wake up call to all of us to respect what ought. There’s something special about sisters & their relationship. You 2 both sound pretty special. Would I be right in saying were overwhelmed with affection for your sister Rhiannon when she arrived unto your towering Eyre? 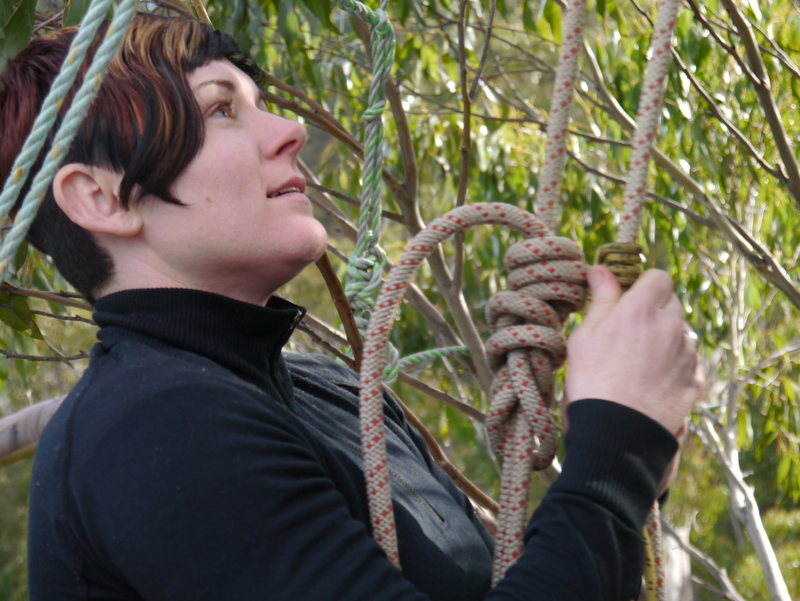 Rhiannon has had to deal with what is to most of us a fearful phobia, (acrophobia) such as ascending skyward by rope to some frightening height. As regards the latest news about the continuing slaughter of our Mighty Ancient Forests, we have witnessed the pending fragmentation of the GBE known as Forestry Tasmania, by way of the “letter of resignation” from the executive board of new Chairman Mr Miles Hampton. I do not know if you are aware of the significance of this Old Growth Forest slaughtering advocate and to the consequent slaughter by way of collateral damage to so much of Tasmania’s indigenous wildlife, through his proffered letter announcing his resignation? Interestingly his letter also contained a scathing reference to forestry minister Bryan Green, (well overdue in my opinion,) so as I say, the fragmentation has begun. I am firm in my opinion that your time up there in your tree-sit, way on high among the flight path of Eagles, standing your watch there among the top realm of our iconic Old Growth Forests, you personally have helped to bring this Forestry Tasmania earthquaking event to this ignition phase of its soonest wholly ruptured and fragmented oblivion. Please keep well, hold tight onto your purposes and dreams, for one day you will be even more highly regarded for your brave sentinel vigil. Oh Miranda I am so glad that you and Rhianon have had such a good visit together. I was so worried about you during those high winds. You and your crew are amazing people. That offer goes for anyone else who’d like to see them. Also included are a range of pix of the burnt Floz camp site, showing the damage, the clean-up, what remains, a special place in the bush etc. I put them together to show Miranda, but I’m not sure if she’s received them.